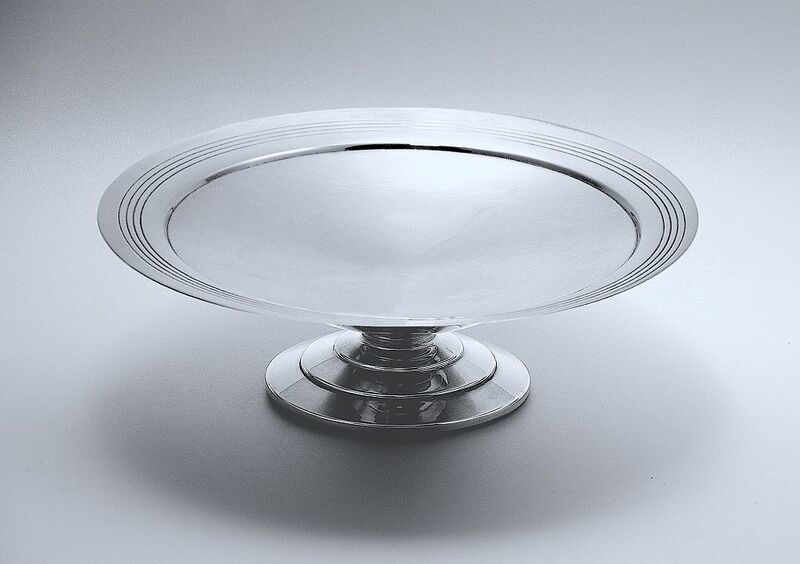 This extremely elegant Art Deco silver plated footed tazza is by Keith Murray for Mappin & Webb. The three tiered foot supports the concave top that has 4 incised rings running around the outer edge. The underside of the foot is stamped "Triple Deposit" with the triskelion emblem below. "Mappin & Webb's Prince's Plate London & Sheffield" with the letter "0" in a shield shaped cartouche and "W27701 Rd 772183 0909" beneath. Keith Day Pearce Murray was born in New Zealand but came to England when he was 14. He qualified as an architect but turned his hand to illustrating before becoming a full time designer. He worked on a freelance basis for the glass makers Steven & Williams and then for Wedgwood pottery and his designs in metal were created for Mappin & Webb. In 1936 he was appointed architect in charge of designing Wedgwood's new factory in Burlaston and he returned to architecture after the war. 'W28341' & 'M931'.